I was using Samplitude ProX 3 all year and am jumping ship to return to Cakewalk. I have some unfinished projects that I want to finish. I exported a single midi track by soloing it in Samplitude. In Cakewalk, I imported it into a new project. I see midi data but there is no sound, though I do see the levels moving up and down. My guess is that I must assign an instrument to the midi track. How do I go about doing this? I right clicked on the imported midi track and inserted instrument track. That creates a new track and I can choose the instrument but the midi track knows nothing about this new instrument track. What is the correct procedure on how to import a midi track and assign it the same sound it had originally? CbB with automatically assign TTS-1 when opening a MIDI file as long as there is no MIDI output device specified in preferences. This automatic mapping only happens when opening MIDI files, import require manually adding a synth and setting the MIDI output to the synth. In this case, the easiest way to add a synth would be either using Insert > Soft Synth from the main menu or dragging a synth from the Browser. Both will open the Insert Soft Synth Options dialog. Select "First Synth Audio Output" in this dialog to have the synth and an audio track added to the project. Routed the MIDI track output to the synth and the imported MIDI will play. NOTE: importing MIDI files strips tempo from the file. Opening a MIDI file preserves tempo. Here's how I do routing: extend the grab bar to the right of the track name and pull it out so you can see the various options. Then, under output, choose the synth you inserted. Then, in the next option, choose a channel. Actually, you don't need a channel in some synths, like Dimension Pro. But in most, like Aria or Play or Kontakt, you do. you also need to do some setting up on the synth, usually just the channel (Aria, Play), but sometimes the output as well (Kontakt). Thanks for the replies but I am not having any luck. I open a new empty project. I import the MID file. I can visually see note entries and sound waves. When I play, I hear nothing but can see the audio levels moving up and down. If I do what scook said above, and go to Insert, Soft Synth, I see the vst instruments that I have. I choose the one it will actually be and choose "First Synth Audio Output". I am lost after that. I do not know how to route the midi to the synth. I thought that I could copy the midi track to the new Soft Synth track, but that does nothing. I also did what michael said above by going to the imported midi track, select the vst instrument as my output but there is no sound. I thought this guy did a great job of making an easy to follow tutorial on midi..
- Import desired MIDI clip/data from File|Import|MIDI. That should do it. If you don't hear any sound, then check your settings for your sound card/audio interface and your signal flow. The song I created in Samplitude has many different midi tracks. One for the kick drum, another for the snare, one for the keys, etc. I exported each of them individually. I assumed that I would need to import them individually. So, I am doing as told above by chris r. and started Samplitude. I opened (instead of imported) the kick drum. I see the midi data and the waves. I also see the level meter rising and falling, but there is no sound. It is a MIDI track. There is definitely no instrument assigned to it and I do not see any way to add one to this midi track. My audio works fine. If I right click and insert instrument on an empty track, I hear whatever instrument I choose. I have been doing what technot said above without any luck. I start with an empty new project. I insert an instrument track. I import my midi file. I "see" the lines and dots and sound waves in the timeline of the track but when I play the song, the audio meter does not move and I hear nothing. If I double click the instrument (icon on the top left of the track), it opens and when I press a key, I hear sound. So, my audio and interface is fine. I just cannot import a midi file into Cakewalk, which is not good because I have multiple projects and hundreds of midi tracks to import without having to record them all over again. I think I'm reading that you are not assigning a VST instrument to the imported midi tracks. Midi makes no sound without an output to a VST or hardware synth. As said you should read a little about using MIDI first as I think you might not have grasped how it works yet. And there's no reason to export and import each track individually. You just save the original in from Samplitude as a Midi1 file and then OPEN that file with Cakewalk. All the tracks will be there. Midi files are universal and easily saved and opened in any DAW. I second sock monkey, any reading about the basics would help in the beginning. If you go through the cactus tutorial, you should be more familiar with the way audio/midi/vsti routing is done in cakewalk. TTS-1 is a basic midi synth, great for doing some quick ideas. If you want to assign the same vst instruments that you have been using in Samplitude, then you need to check out the basics in online manual and cactus tutorial, or follow the other replies here in this thread on how to do that. It's not that difficult, you just need the basics to start with it. Sock Monkey, I have been using midi since the late 80s and have a pretty good understanding of it. I understand that midi contains only data and no sound. I have used it extensively with external sound modules in the past. I see no option in Samplitude to save as a mid file. I only get one choice, which is VIP. I have saved many projects as midi files in the past with cakewalk, so I understand that. It seems my only option is to export the single tracks as mid files from Samplitude. So, there is nothing in your post that can help me but thanks anyway. Chris R, I do have two midi outputs in my preferences because I need them for my two external sound modules. When I import a midi file, Output, it is set to midisport 4x4 Out A but I also have choices for midisport 4x4 Out B, New Drum Map and Drum Map Manager. In this case, I want to use a VST Instrument. I do not see anywhere to choose one. So, I see the midi data on my timeline. I see the levels moving up and down with the data so something is registering. I just need to assign an instrument to this. Since the instrument is an old Yamaha RX11, there is nothing standard about the key assignments. It isn't where the kick is a C and the snare is a D. It is completely random, which didn't cause an issue in Samplitude. Lastly, I just inserted an instrument track. I saw TTS-1 but chose the Yamaha RX11 I mentioned above. I created the track. The interface opened and I pressed a key and heard the sounds. All good. So, now I have an instrument track with an assigned instrument that is audible. Wouldn't common sense dictate that I copy and paste the midi data from the imported track to this track would cause it to play? It doesn't. My output is set to my Audio Interface Master out. If I go to the drop down and choose selected track outputs, I get a choice of the two midi outputs and the RX11. No matter which I choose, I get nothing. I have read all of the suggestions above but still cannot hear anything. Has anyone tried doing what I am doing successfully? If not, I will simply start from scratch. All good. So, now I have an instrument track with an assigned instrument that is audible. Wouldn't common sense dictate that I copy and paste the midi data from the imported track to this track would cause it to play? It doesn't. My output is set to my Audio Interface Master out. If I go to the drop down and choose selected track outputs, I get a choice of the two midi outputs and the RX11. No matter which I choose, I get nothing. Some things you say here I do not follow. That would make a big difference.. I'll just assume it's the VST. Then reading your output assignments also seems wrong. Your using an instrument track. I just tried this to test and yes when I move midi data from a midi track to the instrument track I hear nothing... You need to use a midi data track or a simple instrument track which is a combination midi and VST track. When you insert the VST it will ask you. Insert a MIDI track, drag your data there, assign it's output the the RX11. that should work. If the GUI for the RX11 plays sounds then you have all else correctly routed. If you double click the midi data track and open the PRV do you hear sounds when you click on the keyboard to the left? that proves you have that output correctly assigned too. If you do take the time to follow my tutorial you will learn how to have 100% success in using midi data. Thanks Cactus. I went to your site and I will read your tutorial. One question, where do I choose "simple instrument track"? I do not see that option in Cakewalk but I do recall seeing that in Samplitude. All I see in Advanced tab is Split Instrument. Thanks Cactus. I went to your site and I will read your tutorial. One question, where do I choose "simple instrument track"? I believe you are looking at the Instrument tab of the Add Track dialog (scroll down to the "to create instrument track" section) . By default this dialog creates an instrument track. The "Insert Soft Synth Options" dialog in msg #14 above is used by other methods of adding soft synths to projects. Sorry Cactus. I am lost on step one of your tutorial. I downloaded and opened Run For Your Life (great song). I deselected all midi outputs other than Microsoft GS Wavetable. PLayed as you stated. I added the Synth Rack so I could see it. Your tutorial shows to click on Track 10 and "select icon to open TTS-1 GUI." I do not have that. Your icon is an instrument track icon. I have a midi icon and if I click it, nothing happens. What do I do? My post was written after your last post, which wasn't clear at all and said I need to add a midi data track and simple instrument. Nowhere did you mention "soft synth" which is yet another available option. I inserted an Instrument, not soft synth, based on your comment above so there was no mention of Simple Instrument. I had not looked at the tutorial yet, but I am lost on the very first steps of your tutorial. When I look at my Run For Your Life, it is different than your tutorial. Your first track is SI Drum Kit and mine is Standard Drum Kit (which is your 2nd track). I mentioned in a previous post that your track 10 is an instrument track and mine is a midi track, so nothing happens when i click the icon. I don't want to skip all of the beginning steps because I will be lost even more than I am now. Your response seems to indicate that I am not able to understand simple instructions. Just so you know, I run the IT dept of an huge State run Medical school and have worked in IT for 24 years, am MS Certified, etc etc. so I am not someone who does not understand technical issues. Quite the opposite. But, this tutorial is confusing maybe because it is older or maybe this version of Cakewalk is different than Sonar. Either way, it is hard to follow if anything has changed because as soon as a step is different than what I see now, I will have to skip it and will most likely lead to further confusion later. There are two basic track types audio and MIDI. An instrument track is a hybrid consisting of an audio and MIDI track that presents a MIDI track input section with an audio track output section. If you create an instance of TTS-1 using the Add Track menu (link in msg #15) and import MIDI into that track it should play. Note the audio meter output while the transport is playing. 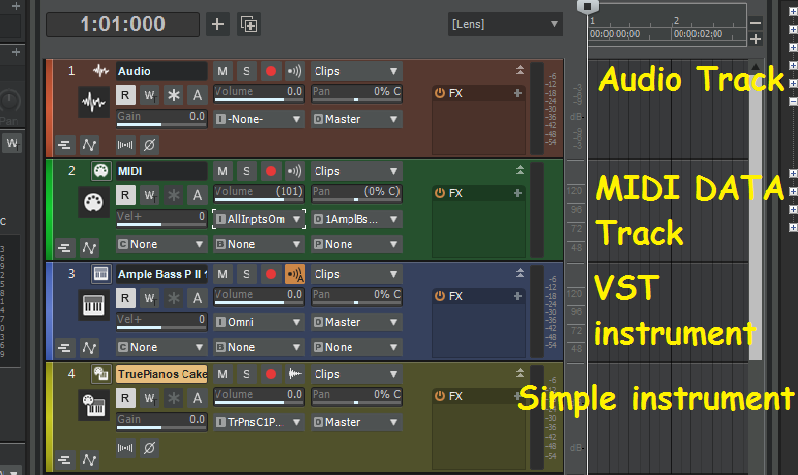 Once they synth has an audio track and MIDI track associated with it, right-click on either track and select "Make Instrument TracK" to merge the two tracks into an instrument track, if desired. BTW, many disable the MS GS Wavetable Synth in MIDI output device preferences and use TTS-1 whenever GM is needed. Sorry my tutorial didn't work for you. I've had dozens of PM's from people thanking me and saying it was very helpfull. There is very good documentation on this from Cakewalk but most found it was not easy to follow either. Each person learns differently. I'm more than willing to improve it but your the first one who has pointed out any issues. And I'm not sure if anything I use in the tutorial has changed. I even used Home Studio to test some things. I will go look at the tutorial and see what's up..
which wasn't clear at all and said I need to add a midi data track and simple instrument. Nowhere did you mention "soft synth" which is yet another available option. You need to use a midi data track or a simple instrument track. I didn't mention inserting a soft synth as that is kind of obvious otherwise how would you get a instrument track or simple instrument track? I see Steve has posted a excellent little video that is super easy to see what we are all trying to say. I hope that works for you. Thanks for all of the responses. I am not knocking your tutorial. I am sure you put a lot of work into it. I think a few things have changed though. Take a look at the very first pages. It is probably no big deal if you know your way around cakewalk but if you are trying to figure it all out, any difference in a tutorial and what the user is using will throw them off. I can easily insert a soft synth and choose simple instrument as I have done hundreds of times in Samplitude and Cakewalk back in the day. I was just in the wrong place and adding an Instrument instead of a Soft Synth. So, I have no problems with new tracks or anything. My original question about importing or opening the mid file from Samplitude is still the issue. I just had an idea. I created a new SoftSynth track and chose the Yamaha RX11 vsti. I then imported the midi file from Samplitude midi. I copied the midi data to the soft synth track and still nothing. What confuses me is that I can play notes and record and it will play. Why does Cakewalk care if I record it now or if the info is copied in? The notes are the same? Now I see the problem. The RX11 kick drum is the A4 key but it is assigned to the C3 key. My guess is that the note information did not follow. I think I read somewhere in the this thread that one should not import a mid file but instead open it. I think it will just be easier to re-record everything. I'm sorry You keep asking the same question and you still have not followed the instructions which are still the same as when I made the tutorial. You need to CAREFULLY read the instructions. If you follow them it will work. I copied the midi data to the soft synth track and still nothing. Is this a simple instrument track? Just a few things before getting to what I believe is the problem. Opening and importing MIDI files do the same thing when it comes to MIDI note and CC data. The recommendation for opening MIDI files instead of importing is to preserve all the MIDI data and automatically load TTS-1 so that the file is ready to play. Often is this is a useful starting point for working with MIDI files. The import process strips out tempo data instead relying on the existing project tempo map. The open process does not strip data from MIDI files. Given, new data may be recorded and played back means basic synth routing is not the problem. I think this is the problem - the MIDI files are GM but the drum synth is not. If the drum synth cannot be set to play GM files, the usual solution in Cakewalk is a drum map. One of the functions of a drum map is translating MIDI notes input to the notes required for the synth. Cakewalk comes with quite a few drum maps but there is not one specifically for the RX11. Maybe one of the other Yamaha maps will work. If not, you will need to create one if you plan on using GM files with the RX11. Steve might be onto something. If Sampletude is using GM and the VST is using say notes out of range the you won't get sound, When you open PRV and play the notes on the sidebar keyboard are they GM standard? Example the kick should be C3. and then something is weird about the install process. Once you un zip the file all you get is a text and a dll. file,,, OK that is normal but it was huge?? this is not normal.. If you click on it you get the expected note pad showing a bunch of gobbly gook. So I dropped the dll into my VST folder and Cakewalk found and added it to the list.. But then when I tryed to insert the VST it came up with error dialog box after error dialog box about missing things. Is this not a sample based VST? I would have expected an installer that ran, not a drag and drop. Anyhoo, seems like your typical freebie and like half of them arn't worth the bother. Anyhow I think the Cactus guy has the issue, You are trying to dump a midi track into a instrument track which don't work. Best to put that in a plain ol' midi track , insert the VST ( I guess you got it to work) and point the midi track at it. Insert the SI drums and point the midi file at that. Open a Blank basic project. -1 Insert the SI drums choosing Single synth output open the GUI and make sure it makes sounds when you bash on things with the mouse. -2 Insert a blank midi track, check the output is pointed at the SI drums. -3 Drag and drop or import the midi data to the midi track. Open the PVR to check data ,,, open the Event list to look for controllers that might zero volume. . Sorry Cactus. I am lost on step one of your tutorial. I downloaded and opened Run For Your Life (great song). I deselected all midi outputs other than Microsoft GS Wavetable. Unselect ALL MIDI outputs, including the Microsoft GS Wavetable. Then try opening up the demo song again. Hit play and the song should playback as is, using the TTS-1 plugin. This would be a good point to start the tutorial at now. If you're not able to hear the MIDI playback from your personal imported/opened MIDI file, but are able to successfully play back the demo song from the tutorial, then the issue likely has something to do with your MIDI file. 1. If you can bang on the instrument plugin GUI to trigger sounds, then your audio setup for that instrument is good. 2. Then try clicking on the note numbers/keyboard on the left hand side of the piano roll view for the MIDI track. If you hear sound from your instrument, then that track is routed to your instrument. But if no sounds are made here, you will need to check that the MIDI track is routed to the correct instrument track. 3. If #1 and #2 above are both good, but your MIDI data will still not play back when copied to the MIDI track you just tested in #2, then I would agree with others that for some reason your MIDI data in the exported file has an issue.